Did you see the latest Shopping Report in the August issue of Lucky? They've shopped Amsterdam for the best in home decor + fashion! I dug through each and every store and found these great links for shops featuring homewares, so check them out. I'll be adding them to the shopping links column (to your right) in the next few days. Until then, here they are! Purchase antique reproductions of enamel street signs, or have one custom made for your home. They ship to the states. Part gallery, part retail store, features all the best in Dutch design from rising star designers. Tchotchkes (I love that word) galore. A two story warehouse in the jordann quarter of Amsterdam featuring everything wild and wacky for lovers of colorful kitchenware. With two Amsterdam locations, this is a shop worth seeking out for lovely items to give or to keep for yourself. This came in as another Lucky editor's pick. Evidently, it's a Dutch decor line that stays ahead of the trends. Sounds like our pick, too! 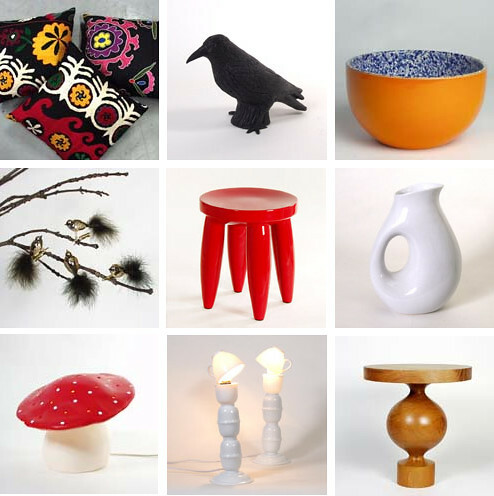 I love the red mushroom light, teacups lamp, and the very cool stools they offer (see image above). The place to go for vintage Scandinavian furnishings (clothes, too!). You won't find much color here, achromatic is the all the rage at sprmrkt. Everything in this store is made of wood, even the rafters hanging overhead that date back to 1565. Sounds ultra Dutch to me! Lille Hus - Fresh for Summer!